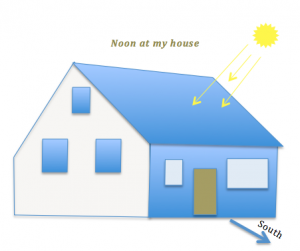 I'm going to help save the planet by adding solar panels to my roof! Should I tilt the panels on my roof to more accurately aim towards the Sun? If so, at what angle should I use? Should I be able to adjust the panels to better receive low winter Sun and high summer Sun? How do I figure all of this out? Like this activity? Check out "The Cost of Light Bulbs" for another environmental science - math activity. ← Where do those convention delegate numbers come from?